Kenya’s first Christian Church, built as a mission in 1846, now a museum to the earliest Christian missionaries. Found 25 km northwest of Mombasa, off the Nairobi – Mombasa highway on the Mazeras-Kaloleni Road. Rabai is well known in the annals of history as the place where Christianity and modern learning in Kenya started well over 150 years ago. 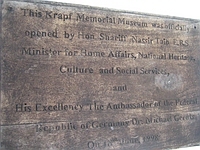 In 1994 the Krapf Memorial Museum was founded to give formal and a perpetual reminder to monumental events during the advent of early missionaries. Stories about the first missionaries were passed on by word of mouth and are still told today. Built in 1846 as the first Church edifice in Kenya, Rabai is situated about 25 km north-west of Mombasa, off the Nairobi-Mombasa highway on Mazeras-Kaloleni road, about half an hours drive from Mombasa.